Cylinder liner for the 4-cylinder model A and B engine. When you can't bore no more, it's back to standard! Size 3/32" wall. Made in USA. New camshaft 1928-34. A brand new cam so no core is required! This is a B cam that will work in 1928-34 4-cyl. engines. .330 lift on intake and exhaust, .244 duration on intake and exhaust. Made in USA. Camshaft dowel pins 1928-31. Two pins are used to hold the fibre timing gear in position on the camshaft. Set of 2. Camshaft nut for the 1928-34 Model A and B engine. Most mechanics take this nut off with a punch and hammer. So you will find a lot of damaged nuts. Check to make sure the nut is not bent. Timing kit 1928-31 Complete Kit. Kit comes with everythng you see plus instructions. This kit allows you to get your timing right n the money using a timing light. Once timing is set, there is no longer any need to set timing using a pin. Also, so you can see how many degrees you are moving cam.Made in USA. "Genuine Nu-Rex". Camshaft thrust plunger 1928-34. Controls the end play in the cam. Fits into front timing cover. Complete with spring. Be sure to grease this little guy when you put it in, or it will make a noise that sounds like your motor is coming apart! Made in USA. Plastigage 1909-31. Plastigage takes the guess work out of putting the proper clearance in rod and main bearings. 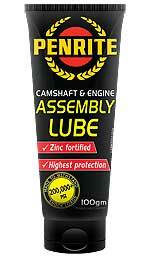 A must when checking or adjusting bearing clearance. .001-.003. Made in USA. Crank gear key 1928-31. Goes on the crankshaft to hold the crank gear in place. Made in USA. Crankshaft gear for the 1928-34 Model A and B engine. The steel crankshaft gear that drives the fibre gear. Crankshaft oil slinger for the 1928-34 Model A and B engines. This one fits on the front of the crankshaft. Crankshaft pulley Two Piece 1928-31. 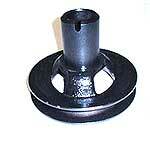 This two piece pulley allows you to remove the pulley without removing the radiator. Crankshaft pulley One Piece 1928-32. A nice cast steel pulley. The one piece pulley is what Ford put on the car when it left the factory. Front pulley Ratchet nut 1928-38. 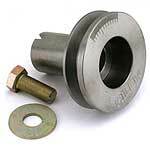 This is the nut that holds the pulley onto the crankshaft and the crank fits into to turn the motor. Made in USA. Ratchet nut wrench for the 1928-34 model A and B engines. Great when setting the timing, instead of the starting handle and makes the job easier, since you can rotate the crankshaft in both directions, helps to find top dead center. This one is more heavy duty that the A-6320 and has a 12 point head. Ideal for your toolbox. 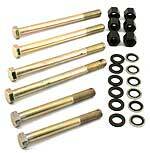 Main Bearing Bolt Kit complete with pressure sealing washers, for the 1928 -1934 four cylinder engine. Kit Contents: 4-6" long grade 8 bolts for front and center mains. 2-4-1/2" long grade 8 bolts with ground heads for rear main. 6-High headed hex nuts grade 8. 6-SAE flat washers. 6-Pressure sealing flat washers. Pressure sealing flat washers can only be used one time! Extra sealing washers are available below. 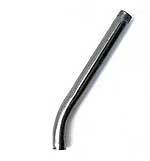 5/16" Oil drain tube for the 1928-29 Model A Ford engine. Screws into the rear main bearing for draining the oil back into the pan from the main bearing. Made in USA. 3/8" Oil drain tube for the 1930-31 Model A Ford engine. Screws into the rear main bearing for draining the oil back into the pan from the main bearing. Made in USA. 3/8" Oil drain tube for the 1932-34 model B engine. Screws into the rear main bearing for draining the oil back into the pan from the main bearing. Made in USA. A brand new forged counterbalanced crankshaft for the model A Ford engine. All bearing diameters are standard. you will need to machine the slinger if you are using one of the modern style rear seals. If you are changing from poured babbit main bearings to the modern insert bearings, we have special 002" insert bearings available for this crankshaft. Order A-6331-002 shown below. Main bearing shim set 0.032 thick 1928-31. Made from laminated shim stock. Two shims for rear main, and four for center and front main bearings. Made in USA. 0.016 thick Main bearing shim set for the 1932-34 model B engine. Made from laminated shim stock. Two shims for rear main, and four for center and front main bearings. Made in USA. If you are using one of the new A-6303 counterbalanced crankshafts, you will need to use these A-6331-002 bearings. 10 thou version of the A-6331 modern main bearing set. 20 thou version of the A-6331 modern main bearing set. 30 thou version of the A-6331 modern main bearing set. 40 thou version of the A-6331 modern main bearing set. These half circle shaped brass thrust washers are used when converting a babbitt style motor over to modern insert bearings. You will need 3 of these per engine. Made in U.S.A. Sold each! 10 thou version of the B-6331 modern main bearing set. 20 thou version of the B-6331 modern main bearing set. 30 thou version of the B-6331 modern main bearing set. 40 thou version of the B-6331 modern main bearing set. These half circle shaped brass thrust washers are used when converting a model B engine with babbitt style main bearings to modern inserts. Brass core plug set for the 1909 - 1927 Model T engine block. These are also known as freeze plugs in the USA. Set of 3.